At the beginning of last month, I posted a photo edited in a different style from my usual crisp, clear, hyper-real style. It was simpler and more focused on contrast, light, and shadow. The silhouetted sunset along the Rivers of America was a fun exercise in doing less in a photo. 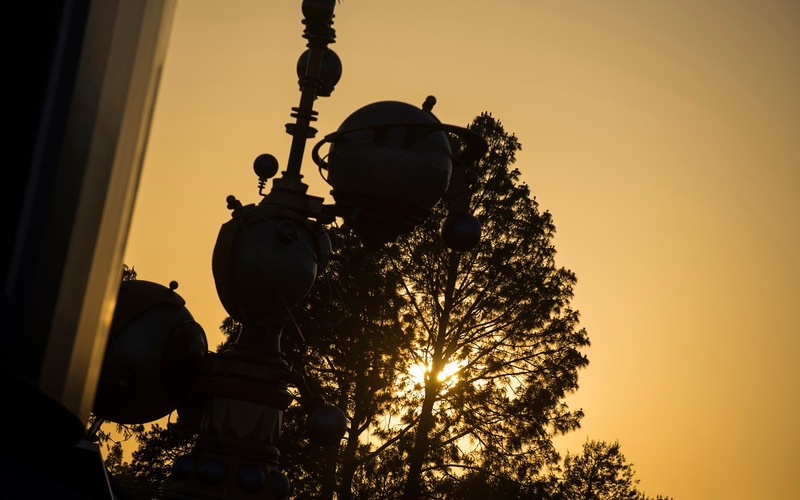 Well, a week ago, I was walking along Tomorrowland, when I gazed westward toward the hub and noticed the setting sun casting everything in front of it into a bold silhouette, darkly superimposed upon a luminous and golden sky. I happened to have my telephoto lens, and I knew that I had to snap a zoomed in detail of this composition. It's merely a glimpse, but it conveys the beauty of the whole afternoon. The Astro Orbiter stands silhouetted against the warm afternoon sun. What do you think about pictures like these? Do you like them and think I should do more, or should I stick with my main style? Feel free to make your voice known in the Comments below!